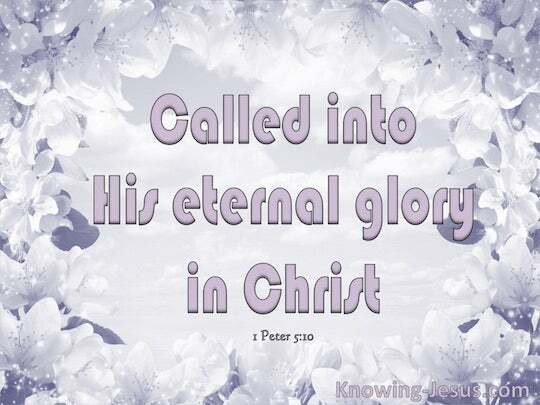 ﻿ 1 Peter 5:10 After you have suffered for a little while, the God of all grace, who called you to His eternal glory in Christ, will Himself perfect, confirm, strengthen and establish you. Now the God of all grace, who called you to His eternal glory in Christ Jesus, will personally restore, establish, strengthen, and support you after you have suffered a little. After you have suffered for a little while, the God of all grace, who called you by the Messiah Jesus to his eternal glory, will restore you, establish you, strengthen you, and support you. And may the God of all grace who called you to his eternal glory in Christ Jesus (after suffering a little while) himself thoroughly prepare you. He will establish, strengthen, and provide a foundation. And the God of all grace, who called you unto his eternal glory in Christ, after that ye have suffered a little while, shall himself perfect, establish, strengthen you. And after you have suffered a little while, the God of all grace [Who imparts all blessing and favor], Who has called you to His [own] eternal glory in Christ Jesus, will Himself complete and make you what you ought to be, establish and ground you securely, and strengthen, and settle you. And the God who bestows every unearned favor [upon His people], who invited you to partake of His eternal splendor through Christ Jesus, will restore, confirm, strengthen and stabilize you people [in the faith], after you have gone through a brief time of suffering. But may the God of all grace, who has called us to his eternal glory by Christ Jesus, after you have suffered a while, make you perfect, establish, strengthen, confirm you. And after you have suffered a little while, the God of all grace, who has called you to his eternal glory in Christ, will himself restore, establish, and strengthen you. but may the all-gracious God, who has called us to eternal glory, perfect, confirm, fortify, and settle you, during the short interval of your sufferings. And God, the giver of all mercy, who through your union with Christ has called you to his eternal glory, after you have suffered a little while will himself make you perfect, steadfast, and strong. Now the God of all grace, who hath called us by Christ Jesus to his eternal glory, after ye have suffered a while, himself shall perfect, stablish, strengthen, settle you. But the God of all grace, who has called us unto his eternal glory by Jesus, the Christ, after ye have suffered a little while, he himself perfects, confirms, strengthens, and establishes you. And the God of all grace, having called us to his eternal glory in Christ Jesus, may he put you in proper order, having suffered a little time, may he support you, make firm, lay the foundation. But the God of all grace, who has called us unto his eternal glory by Christ Jesus, after that you have suffered a while, restore, establish, strengthen, settle you. And the God of all grace, who called you to his eternal glory in Christ, [after you] have suffered for a short time, will himself restore, confirm, strengthen, [and] establish [you]. 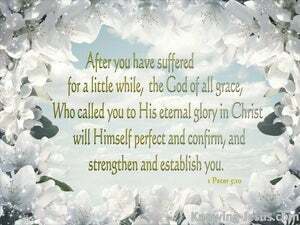 But the God of all grace, He calling us to His eternal glory by Christ Jesus, after you have suffered a little, He will perfect, confirm, strengthen, and establish you. The God of all grace - which called you unto his eternal glory by Christ Jesus - shall his own self, after ye have suffered a little affliction, make you perfect: shall settle, strengthen, and establish you. Once you have suffered for a little, the God of all grace who has called you to his eternal glory in Christ Jesus, will repair and recruit and strengthen you. 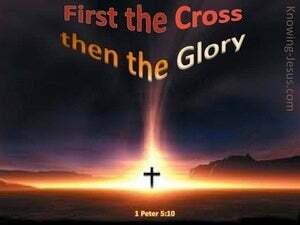 But the God of all grace, who has called us by Christ Jesus to share his eternal glory, will, after you have suffered a while, make you perfect, stablish, strengthen, settle you. And, after you have suffered for a little while, the God of all grace who called you to his eternal glory in Christ will himself restore, confirm, strengthen, and establish you. And the God of all grace, who called you to his eternal glory in Christ, after you have suffered a little while, will himself restore, confirm, strengthen and establish you. But the God of all grace, who called you to his everlasting glory in Christ Jesus, will, after ye have suffered a while, himself make you perfect, establish, strengthen, settle you. And may the God of all grace, who called you to his eternal glory in Christ Jesus, when you have suffered a little while, himself make you perfect, confirm, strengthen, establish you. But the God of all grace, who hath called us to his eternal glory by Christ Jesus, when ye have suffered a little while, himself perfect, stablish, strengthen, settle you. God, from whom all help comes, and who called you, by your union with Christ, into his eternal glory, will, when you have suffered for a little while, himself perfect, establish, strengthen you. But the God of all grace, who hath called us to his eternal glory by Christ Jesus, after ye have suffered a while, make you perfect, establish, strengthen, settle you. And God, the giver of all grace, who has called you to share His eternal glory, through Christ, after you have suffered for a short time, will Himself make you perfect, firm, and strong. But may the God of all grace, who called you to his eternal glory by Christ Jesus, after you have suffered a little while, perfect, establish, strengthen, and settle you. And the God of all grace, Who called you into His everlasting glory in Christ, after ye have suffered a little while, will Himself perfect, confirm, strengthen, settle you. But may the God of all grace, who hath called us to his eternal glory in Christ Jesus, after ye have suffered a little while, make you perfect, confirm, strengthen, and establish you. 9 But resist him, firm in your faith, knowing that the same experiences of suffering are being accomplished by your brethren who are in the world. 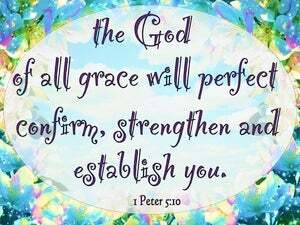 10 After you have suffered for a little while, the God of all grace, who called you to His eternal glory in Christ, will Himself perfect, confirm, strengthen and establish you. 11 To Him be dominion forever and ever. Amen. comfort and strengthen your hearts in every good work and word. so that you would walk in a manner worthy of the God who calls you into His own kingdom and glory. For this reason I endure all things for the sake of those who are chosen, so that they also may obtain the salvation which is in Christ Jesus and with it eternal glory. Though I walk in the midst of trouble, You will revive me; You will stretch forth Your hand against the wrath of my enemies, And Your right hand will save me. but I have prayed for you, that your faith may not fail; and you, when once you have turned again, strengthen your brothers." Fight the good fight of faith; take hold of the eternal life to which you were called, and you made the good confession in the presence of many witnesses. For You, Lord, are good, and ready to forgive, And abundant in lovingkindness to all who call upon You. But You, O Lord, are a God merciful and gracious, Slow to anger and abundant in lovingkindness and truth. "I will strengthen the house of Judah, And I will save the house of Joseph, And I will bring them back, Because I have had compassion on them; And they will be as though I had not rejected them, For I am the LORD their God and I will answer them. "And I will strengthen them in the LORD, And in His name they will walk," declares the LORD. even us, whom He also called, not from among Jews only, but also from among Gentiles. It was for this He called you through our gospel, that you may gain the glory of our Lord Jesus Christ. Whoever speaks, is to do so as one who is speaking the utterances of God; whoever serves is to do so as one who is serving by the strength which God supplies; so that in all things God may be glorified through Jesus Christ, to whom belongs the glory and dominion forever and ever. Amen. seeing that His divine power has granted to us everything pertaining to life and godliness, through the true knowledge of Him who called us by His own glory and excellence. This is the promise which He Himself made to us: eternal life.